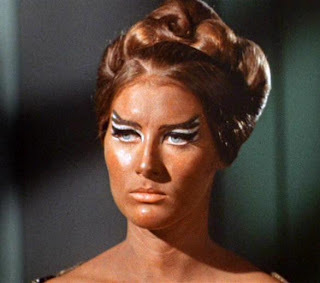 You can tell she's a klingon because of her generous application of self-tanner and her creative use of eye-shadow. That's the warrior's way. Posted by Super Happy Jen at 7:17 p.m.
Jen I'd never thought about being afraid of labour before you mentioned it! AHHH! I'm checking daily to see how it goes..Kate from Magazines Class p.s. HI MOM! I totally agree with Adam. That beats the heck out of crystals and relaxing music. You just know that Klingon women ENJOY labour, and then immediately get up, kid under one arm and continue to fight their enemies. Their armour is obviously designed for ease of breastfeeding. was just looking for pictures of the original klingons and stumled across this. Cheers! 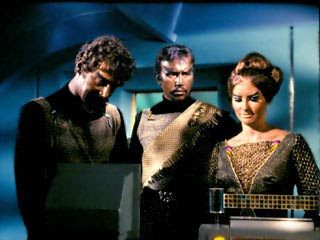 There was another Klingon Female in the Day of Dove episode. Wow, this is an old post to be commenting on. Could it be this blog post has gone viral?